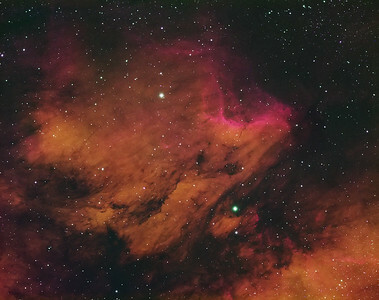 My first narrowband capture of the Pelican Nebula IC5070. This nebula is part of a very large region that also encompasses the North American Nebula, located in the constellation Cygnus. Captured within the city limits yellow zone. Seeing and transparency were below average and effected by significant ambient light pollution and the current moon phase. Used my Orion ED80T on an Atlas Pro AZ/EQ-G mount, with the StarShoot mini guider package. 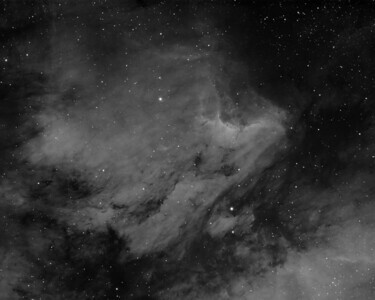 Capturing camera was an Atik 460ex, with a Televue TRF-2008 0.8 reducer/flattener and Astrodon 3nm Ha, OIII, and SII filters. Captured 11x15min Ha, 3x20min OIII, and 2x20min SII subs. No darks, flats or bias frames collected. This does not represent a lot of narrowband data, and is work in progress. I wish I could have gotten more OIII and SII data, but I unfortunately had to deal with the moon and some trees that got in the way. Of the three NB filters, OIII seems to be the most sensitive to the moon, so care must be taken. Post processing was done with PixInsight and Photoshop CS6. For this false color images, I used the Hubble and HSO Color Palettes. Pelican Nebula IC5070 using HSO color palette RGB mapping. Ha=Red, OIII=Green, SII=Blue.